The Deacons - grahambellinger's JimdoPage! - Thanks for the kind words Steve! Our first new studio recordings for 30 years. "The Deacons... In 1974 a crack bunch of teachers were sent to the Midlands by education authorities for crimes they didn't commit. These men promptly escaped from the maximum security classrooms of Hednesford and Codsall to the Staffordshire folk music underground. Today, still wanted by the authorities, they survive as musicians of fortune. If you have a problem, if no one else can help, and if you can find them, maybe you can hear them - The Deacons are coming!" 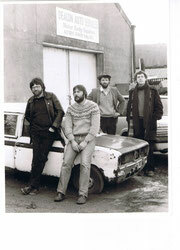 In 1987 they were joined by Martin Thompson - all instruments known to mankind. They released a cassette in 1985 'Happy As Saturday' and an LP in 1987 'Using That Thing'. 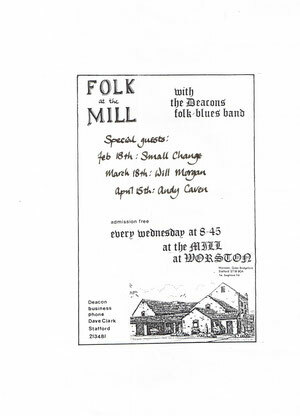 They ran a hugely popular folk club at Worston Mill near Stafford throughout the 1980s. They took an extended holiday from 1991 when Graham moved to Cheshire but reformed in 1997 to celebrate the LP's tenth anniversary. They enjoyed it so much that, despite many requests from the audience, they still play the occasional gig whenever they get the chance. Bott, Dave and Martin can be found singing and playing in a session at the Spittal Brook pub in Stafford most Tuesdays. 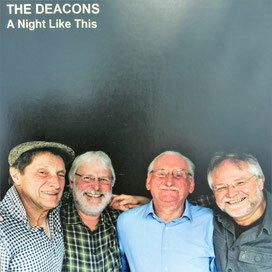 In 2014, following many requests, The Deacons released 'Hurrah For The Life Of A Country Boy' - a CD of their recordings from three decades including radio sessions and rarities as well as some old favourites.